Matthew Kimes (? ?-1945) – Oklahoma bank robber, murderer, and brother of George Kimes, Matthew led the Kimes Gang in the 1920s. The two Kimes brothers began their outlaw ways at a young age as little more than petty thieves but quickly moved on to bank robbery. Thieving throughout Arkansas, Arizona, Kansas Oklahoma, and New Mexico. On August 27, 1926, Sequoyah County, Oklahoma Deputy Sheriff Perry Chuculate and another officer stopped a speeding vehicle. The vehicle, which was stolen, contained both Matthew and his brother George Kimes. As the officers approached the car, the Kimes brothers opened fire, killing Deputy Chuculate. The outlaws were convicted of manslaughter in connection with ‘s murder and sentenced to 25 years in prison. One of the brothers, Matthew Kimes, escaped from prison and continued his crime spree. George was sent to prison at McAlester, Oklahoma. However, Matthew was still in jail when members of his gang forced their way into jail at gunpoint and rescued him. 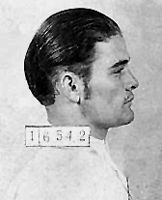 Matthew continued his crime spree with the Cotton Top Walker Gang, which was responsible for the murders of Patrolman Coke Buchanan, of the Borger, Texas Police Department, on March 19, 1927; Deputy D. P. Kenyon and Deputy Almer Terry, both of the Hutchinson County, Texas Sheriff’s Department, on April 1, 1927; and Chief W. J. McAnnally of the Beggs, Oklahoma Police Department, on May 18, 1927. Kimes was tracked down and arrested in Flagstaff, Arizona, on June 23, 1927. He was sentenced to death in the electric chair for complicity in the death of WJ. McAnally. His sentence was later commuted to life in prison. He was turned down for parole in 1945, but was given a brief leave of absence, during which time he robbed a bank at Morton, Texas. On December 1, 1945, he was killed when he was struck by a truck in Little Rock, Arkansas.